I’ve set my alarm at 5:30am for the trip in grotto. When I checked the other rooms through our window, I saw Dee getting ready to visit the grotto. I hurriedly open our door and told her that I want to go with her. I asked her to wait for me for a few minutes while I brush my teeth, comb my hair and gather up my things (sun block, coin purse and camera). At that time Hubby is still sleeping and I assume that he slept at around 4am so asking him to join us will be impossible. The scent or the morning air is welcoming when we hit the beachfront. I spotted a taho vendor and hurriedly bought one for myself since I need to fill up my stomach with something before walking. We walked from Station 2 going to Station 1 on the beach side where hotels, restaurants and bars are lined up. I didn’t mind the long walk that we had since I was busy checking out the hotels on our side and noticing the well refined sand on our feet, indication that we are in Station 1. There are some people who are off for a morning jogging (foreigners) while others are simply loitering on the seashore and enjoying the view of the sea early in the morning. My friend, Dee told me that we are lucky that it’s not high tide otherwise we will be swimming our way to the grotto. We make a quick stop in Jonah’s fruit shake because my friend is craving for one. I had to pass the treat since I didn’t eat any heavy breakfast. 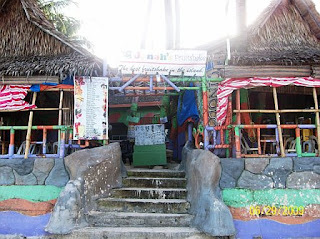 As I remembered, Jonah’s fruit shake is famous on Boracay Island. The price range of the shakes starts at Php 80-90 pesos. We only waited for 5 minutes and the shake is ready. It is placed in a mineral water bottle with a straw. Dee told me that the shake was good. Sigh! I wish I had ordered but I’m worried on what will be my tummy’s reaction if I did get a dose of the shake. Once neared the grotto there were a few people who were there having there picture taken. So we waited patiently for my turn. After the photo ops, the sun is starting to rise and we are planning to go back to Station 2 via jeepney (hehehe. We got tired of walking). As we are making our way to the road, my mobile phone rings and it was my aunt asking me where I am. I told her that we are already on the grotto and she told me to wait for them as they are preparing to leave. I asked my aunt to wake up Randiej so he can join us. I told my friend about it and so we waited for them on a cemented stairs of a bar/restaurant (I didn’t catch the name of the place). After a few minutes we saw my aunt and her bf coming toward us. She told me that Randiej wants to sleep and he told them that they can go ahead without him. That’s what happens when you’re always awake at night and early dawn. You missed the fun in the day…hehehe. So we waited again for my aunt and her bf while they are busy having their pictures taken in the grotto. After 15-30 minutes we were walking our way back to Station 2. We stop a few times checking out any restaurants for breakfast meals then my friend and aunt stopped into a Banana Q and Camote Q vendor to buy one for themselves. I decided to buy for me and Randiej since we don’t get to eat this at home. I was munching my share while walking our way back home. In our room, Hubby is still sleeping so I left the sweet treat on the table then my aunt and friend asked me to eat a heavy breakfast. We went to D’ Talipapa and went to one of the eatery who offers La Paz Batchoy, Bulalo and their specialty which is goat dishes. My aunt ordered a goto while her bf ordered a Lap Paz Batchoy. My friend on the other hand ordered Bulalo while I sat with them. I didn’t order anything since I feel full and I’m not hungry at that time. My two other friends are looking for other eateries where they can eat which happens to be Andoks. After eating their breakfast, I decided to buy one order of siomai (4 pcs) for Randiej at Siomai’s House. In Manila the 4 pcs. of siomai cost Php 25 but in D’ Talipapa, it cost Php 30. After my purchase we head back to our rooms to take a rest since our afternoon itinerary is going to Mt. Luho where you can see the whole island of Boracay. We are set at 4pm so that’s plenty of time for us to do our own activities. 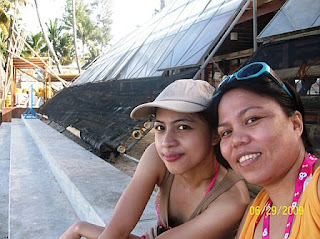 Me, my aunt and my friend take this chance to scout for additional souvenirs along Station 3. When we get out of our room it was nearing lunch time. We stroll our way to Station 3 and I guess probably half-way of the station, we saw the line of vendors selling bracelets, necklaces, earrings and other accessories. Since my aunt is complaining about the heat and the length of our walk we decided to stick with the first vendor for our souvenir purchases. My aunt fell in love with the bracelets that has semi-precious stone and mother of pearl shells. She was able to bargain it for 3 pieces at Php 100. They do have sets which cost Php 150 (necklace and bracelet + earrings). I on the other hand requested for an ID holder as a gift for my sister and for myself….hehehe. It cost Php 150 since the length of the ID holder is equal to one set. In addition to the ID holder, I requested for earrings which cost Php 20 each. I was telling my aunt that we can make it as a business where she can sell it overseas. 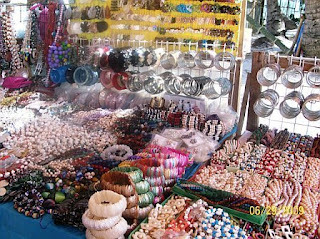 The mother of pearl shell is unique and I’ve never seen any accessories selling in the malls that are made of that kind of shell. Anyway, my aunt is probably thinking about my proposal but I think it will be a good business since she told me before that handicrafts coming from the Philippines are being sold in Bahrain for a higher price. We probably stayed there for an hour or two and the sun is high up in the sky and the ocean is so perfectly blue green. Regardless of the heat, we are happy with our purchases and we are planning to finish our shopping later that night or tomorrow morning. Arriving in our room, Hubby was already awake and I told him that I left him some food to eat. While he was eating his late breakfast and watching TV, I’m trying to get a nap for the afternoon’s agenda. At 3:00pm, I was already preparing for our tour in Mt. Luho. I was just waiting for my friend to knock on our door and give us the go signal. While waiting I received a text message from one of them informing me that we will set to leave at 4:30pm instead. Since we have a spare time, I asked Hubby to have our late lunch/early dinner because for sure we will be hungry once we went to the mountain. We ate Andoks since it’s affordable and they offer a lot of meals to choose from. We finished at 4pm and we went back to our room and prepare the things that we will be carrying. Exactly 4:30pm we troop to the tricycle parking are in D’ Talipapa and rented two tricycles for the trip. They charge us Php 100 per person round trip to Mt. Luho and back to D’ Talipapa. We were told earlier by another vendor in Station 3 that trekking Mt. Luho might be dangerous since there are a lot of contractors coming from different provinces on that area that are taking advantage of the tourist thus she told us that we go there where there is still sun and hired a tricycle instead. Other option going to Mt. Luho is via ATV. I had no idea how much it will cost but my guess it will be around Php 1.5k-Php 2.5k. On our way to Mt. Luho we saw a lot of Koreans riding ATVs going to the same destination. I guess the trip took 5-10 minutes because the road going up is pretty steep. Our tricycle driver told us that it was a good thing that the road was cemented because before they can’t climb the mountain due to the rocky road. At the viewpoint of Mt. Luho you have to climb stairs to the peak point. There’s an entrance of Php 50 per person. 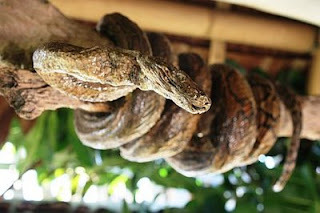 On the entrance point you will see a preserved snake on a branch. I didn’t notice it until my aunt’s bf pull up a prank on her and she gave out a loud yelp of surprise….hehehe. After taking tons of pictures coming from different cameras, we went down and checked out their mini zoo. They have a peacock, bear cat, monkey and a python. On our way down to Mt. Luho we take the chance of taking pictures near the signage (yeah, we are all camera addicts!). 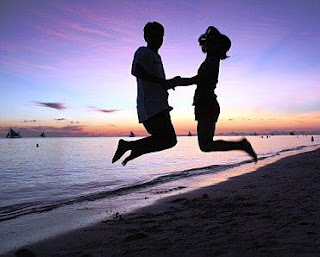 We took turns having our picture taken against the sunset. I super love this photo of me and Randiej. Thanks to Jen for capturing it perfectly! We went back to our rooms to take a rest and put away our things. After a few minutes my aunt and her bf is asking us to have our dinner. The problem is that Hubby and I are still full. They were planning to try the dinner buffet in a nearby restaurant/bar which is only a few steps away from our place once you reached the front beach. I told my aunt and my friends that we are not hungry and we will just wait for them to finish. For the meantime we went to D’ Talipapa and scout for additional souvenir goods that I will be taking home. I bought two white shirts with a Boracay printed on front which cost Php 150 pesos (Php 75 each) and a muscle sleeveless shirt and shorts (terno) which cost Php 100-150. Then aside from that I purchased ref magnets which cost Php 100 for 7 pieces. I guess we spent 45 minutes to an hour on the shops because after putting the merchandise that I bought and going back to the buffet table, my aunt, her bf and my friend are all finished eating. My two other friends decided to eat burger at the D’Mall for their dinner. We chatted for a few minutes and then come up with something to do for the evening. My aunt’s bf asked Randiej to join him in a drinking session while listening to the band in Boracay Regency. Us girls on the other hand will hit the Lonely Planet store in D’Mall because I still need to buy shirts/blouses/sandos for my parents and siblings. We dropped the boys off to the beach front of Regency where they have a band performing every night. During the band’s break, fire dancers will take the crowd’s attention and hop from one table to another for an up close encounter with the fire they used for their dance. At the Lonely Planet there were items that are on sale. I got a blouse for my mother and a racerback top for my youngest sister. Both of them are on 30% off. I decided to purchase a white sando with printed design for my father and two brothers. All three are at 5% off. Other items you will see on the store are flip flops (Havaianas and Ipanema) and their signature product, the hand-painted shirts. Compared to the other shirts they have on the store, it cost around Php 500 and above depending on hand painted design. I’m not sure what time is it but for sure it’s getting late when we stop by the Regency to fetch the boys. I can tell that my husband is pretty drunk because his starting to be talkative. In other words not his usual self. His pestering me to stay with them and listened to the band which I don’t like since I’m getting sleepy. I told him that I’ll just go ahead to our room where I will wait for him. He reluctantly agrees that I should go home. On our room, I immediately took a bath and watched television. After a few minutes I went to my aunt’s room to ask on what time her bf and Randiej will be coming home. She told me that she got a text message and that they were on their way. I went back to our room and started to fall asleep while watching TV. I’m not sure how many minutes have passed but I’m starting to get impatient waiting for Hubby. I don’t want to be disturbed by his knocks when I’m already asleep so I decided to check again with my aunt. When I opened the door, I was surprised to see Randiej and my aunt’s bf on the hallway talking. Hubby asked me why I’m still up and I just answered with a frown and close the door, this time I didn’t locked it. Now I can be at peace to sleep since his back in our room. After 15 minutes he went inside and started narrating stories (in English language) that was told to him by my aunt’s bf. I begged him to save it in the morning instead since we have to sleep early for the flight. Obviously he will not stop acting like a giddy child so he advise me to sleep on the other side of the bed far from him so I can sleep peacefully and he can stop annoying me. It worked! He started to be quiet and his just watching TV while I close my eyelids which started getting heavier and heavier by the minute….